Parents, do you break out in a cold sweat when you see your child surfing the internet? Do you worry about what sites they’re visiting or who’s interacting with them? 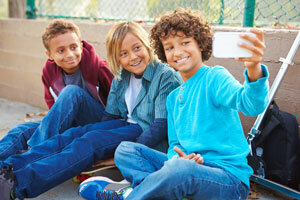 Is your teen or tween’s smartphone use a cause for concern? National Cybersecurity Awareness Month is here, and to promote a better understanding of the online dangers we face, the Identity Theft Resource Center teamed up with CyberScout to conduct a survey entitled “Social Media Habits and You” focusing on cybersecurity in the family setting. Being the caretaker of a young digital native can be anxiety-inducing but banning kids from using digital devices is impractical and may backfire if they start secretly exploring the online environment. So what’s a parent to do? Insisting on good online hygiene is like making sure kids understand they need to look both ways before crossing the street. Let children know you’re there to help, not ruin their good time. The following are best practices parents should follow and instill in their children to keep them, their data and other family members’ online information safe and secure. Communication is key. Talk with your children early and often about the real and present danger presented by online criminals. Let them know what kinds of personal information criminals seek and that they should never divulge online. Let kids know that being online is a privilege, and that you need to see where they go and what they do on it for safety reasons. Set boundaries. Tell kids what sites you want them to stay away from, who they are allowed to text, and what times and for how long they can be online. Use strong passwords. Let kids know they shouldn’t use the same password for every site, and that their passwords, if not generated and managed with a password managing app, should include uppercase letters, special characters and numbers. While it may seem like common sense to you, kids should also be instructed not to use personal information, such as their birth year or name when creating a password. Take a technology inventory. Know what devices, technologies and apps your kids are using and what they have access to. Your teen should understand that you’re monitoring them, not spying. Talk about it with them. Parental control devices. Limit your child’s access to adult programming or websites by enabling software that keeps some sites and actions off-limits. You can block adult content sites or enable settings that send your child (and you) a warning a visit is attempted. Supervise surfing. Set up a computer or laptop in an open area of the house, like a den, living room or kitchen, where Internet use can be supervised. Avoid letting kids spend online time sitting behind locked doors. Teach them to be wary. Kids should learn about phishing emails and smishing texts and know not to click on random links. Pop-up ads with enticing offers are the cyber criminal’s preferred method to introduce malware and/or get kids to divulge private information. Kids are kids. There is no 100 percent effective way to keep children secure online, but you can improve their chances of staying safe by providing good digital parenting through vigilance, honest communication, and a modicum of control. With your help, kids can learn to open online portals to rich sources of information about the world, while keeping out those who wait to take advantage of them. Diamond Credit Union has partnered with CyberScout to deliver valuable identity theft prevention education, proactive protection services, and swift identity theft remediation services. Learn more about CyberScout digital defense tools that may be available to you and your family. Take a look at this infographic illustrating some of the current statistics regarding online activity and today’s youth.